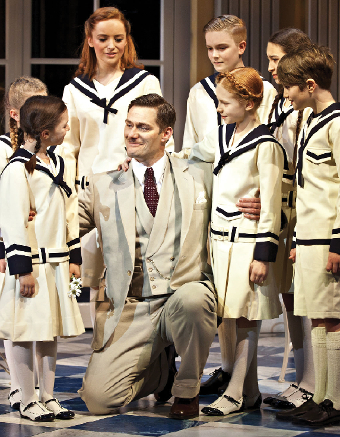 BEING thrust centre stage in an iconic show like The Sound of Music and being asked to sing classic songs such as Edelweiss would be daunting for most actors, but not Stephen Houghton. “In episode six or seven, my fireman character, Gregg Blake, sang a song,” explains the actor, who is about to play Captain Von Trapp. Simon Cowell was a friend of my agent and he thought it would be a really good idea to release the song, which then sold 600,000 copies. This was 1997, a full seven years before X Factor was launched, but Stephen says Cowell was ‘amazing’. “We did Top of the Pops and in those days, as the head of RCA, he would come with me for meetings all day. And I’ll never forget the reception of a hotel or studios where the interviews were being held, which would go on for about three hours. He says that while everyone knows The Sound of Music, he’s not nervous about taking on the role made famous in the film by Christopher Plummer. “Not really,” he laughs. “With an acting career, things throw you all the time. “One week it might be Eastenders, the next week it could be a film, and the following week it could be Cats. So when something is thrown at you, you read the script, and this is such a brilliant part that I’d be a fool not to do it, really. Celebrating the 50th Anniversary of the much-loved musical Julie Andrews film, this new stage production is based on Baroness Maria Von Trapp’s autobiography, and tells the story of the world-famous singing family, from their romantic beginnings and search for happiness to their thrilling escape to freedom as their beloved Austria becomes part of the Third Reich at the start of World War Two. Playing the central role of Maria will be Jessica Daley, who starred in BBC TV’s Over The Rainbow. and Stephen says: “I’ve really enjoyed listening to Jessica sing the songs. Most of them Everybody knows and most are so lovely. You’ve got Raindrops on Roses and Edelweiss that I sing, a lovely song. THE Sound of Music will be at the New Victoria Theatre, Woking, from Monday, June 8 until Saturday June 20.